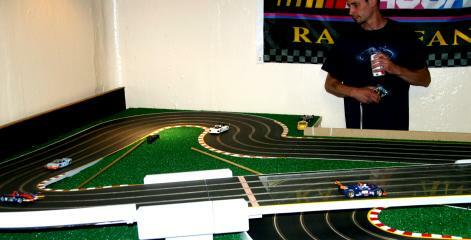 The latest addition to the South East Michigan club racing scene is this really cool 4 lane routed 48 foot 1/32 layout. This track features magnetic braid with steel chips imbedded in the chalk board paint used. 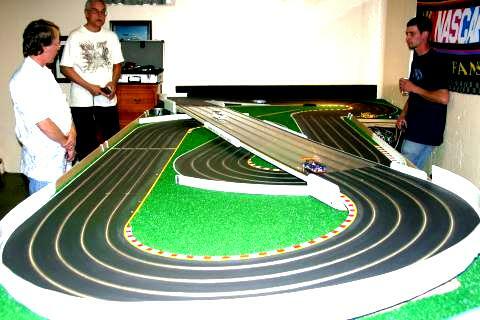 Traction is very good as a result with magnet cars or even cars with no magnets. 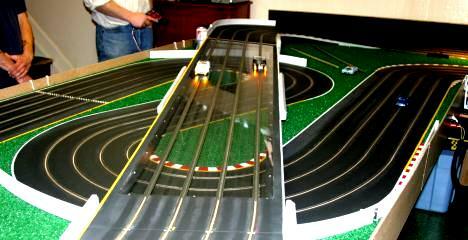 Visio computer software was used to do the design work with incredible precision resulting in very minor finessing when the last section of track was fabricated & installed. 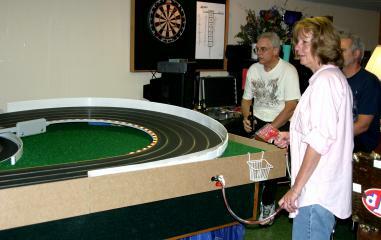 This track features very unique elliptical (not constant radius) turns in several areas made with a specially designed fixture Steve created. 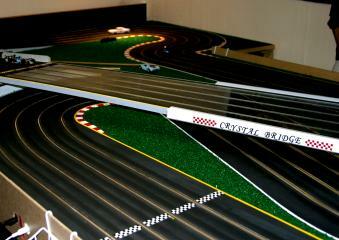 When racing the elliptical turns feel very smooth & the track really "races" as if a much larger layout. A full year went into the planning and the work on this creation with the basement kept "off limits" to all but a select few helpers to make the final unveiling a very special surprise. The 1/32 track comes apart in sections with part folding up against the wall to reveal a 87 foot 4 lane HO track underneath. One very unusual feature is the "Crystal Bridge" fabricated using an acrylic plastic insert to improve visibility of the squiggly sections under the bridge area. The controller hook-ups are cleverly recessed into the front vertical face of the track sides such that nothing protrudes to snag your clothes or body as you walk by, a really good safety feature & cool little wire baskets are used to park the controllers when not in use. The controller stations are oriented around the track to provide natural capability to keep the track marshaled & free of carnage. 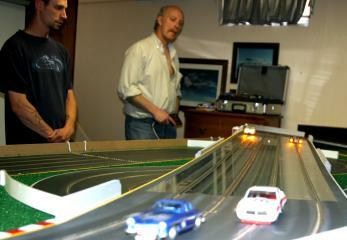 Great fun to race !